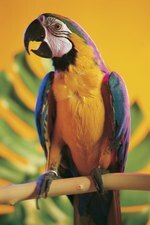 Lovebirds are the smallest members of the parrot family. Although they rarely learn to mimic human voice, they can become quite chatty. In fact, lovebirds cannot only whistle and chirp, but they can be quite raucous. Lovebirds can live up to 15 to18 years and do better in pairs -- although that means you might have to implement some tricks to keep the chatter down. Lovebirds do better in pairs and likely will be happier and quieter with a mate. Getting the two birds at the same time and raising them together might be even better, as they'll learn to keep each other entertained. Regardless of whether you have one or more lovebirds, always make sure you engage their attention regularly. 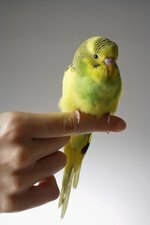 Talking to your bird will make him feel part of the action and he will be less likely to become noisy as a way to get your attention. On the other hand, if your lovebird is being loud, ignore him. will reinforce bad behavior, sending the signal that screaming works. Instead, walk away and wait for him to calm down. Come back when he's quiet to offer a treat and for some bonding time. A bored lovebird is a noisy lovebird. To fight this, make sure your bird has plenty of toys, including bells, ropes, plastic or shatterproof mirrors, balls they can roll around in their cages and more. Ideally, you want to provide a mixture of things they can activate with their beaks and things they can maneuver with their feet, such as roped balls or things they can pick up and move around. Lovebirds are particularly good at destroying and picking apart toys, so pick items that are safe. This includes materials that won't shatter and can't be torn into strips. Lovebirds can become noisy and agitated if they're confined to a cage that's too small for them. Ideally, the cage should be at least 30 by 18 by 18 if you have one or two lovebirds. Larger cages are even better, especially if you use the extra space for hanging toys, perches and nooks and corners where your lovebirds can hide. Birds become active early in the morning, often as soon as the sun comes up and they can hear outdoor noises and movement. One way to reduce early morning noise is to cover the cage at night and leave it that way until you're up and about the next day. In addition, covering the cage allows your bird some privacy and a feeling of security, so he can rest more easily. Although birds are very good at keeping themselves warm, a covering can provide extra protection during particularly cold nights or in drafty rooms.